The direct threat Prop. 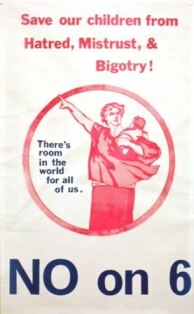 6 posed was responsible for mobilizing record numbers of the community to work against it. 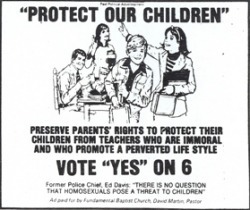 That year, the Pride theme was “Save Our Teachers” and hundreds of people marched to show their opposition to the proposition. The rally took place at the intersection of Sixth and Juniper and the defeat of the “Briggs Amendment” dominated the speeches that day. The event was a big success despite rumors of snipers and a controversy involving people who tried to claim that the event was canceled because they objected to the participation of the Socialist Worker’s Party. 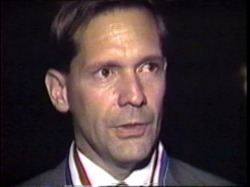 John recalls that there was also some objection to Pride being organized by a committee that involved a number of women. Nevertheless, the event took place despite the best efforts of the opponents. In the end, Proposition 6 was defeated by a wide margin thanks to a statewide push from a united community and its allies. One surprising ally came from former Governor Ronald Reagan who spoke out against the passage of the initiative. 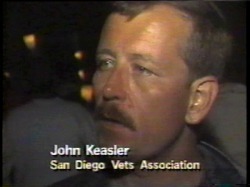 In the years since John Keasler has remained involved in Pride to varying degrees. He continued to march for a number of years, and these days he organizes the “Art of Pride” display at the festival each year which features artwork with an LGBT theme. about gay and lesbian service members. In 1978, we held a series of ceremonies on the major holidays to underscore the mistreatment of GIs in the military. 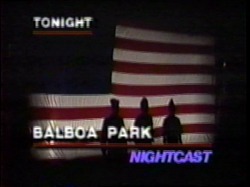 And we also brought the Veterans Day Parade back to San Diego after a 20 year absense. The SDVA brought nationally known Sgt. Perry Watkins to San Diego. 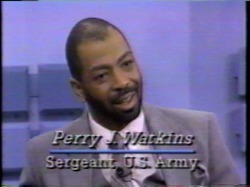 Perry was pretty much out for most of his career and time in Viet Nam. At the end of the war, just short of retirement he was discharged for being gay. Though he won his court case he would never return to duty. He subsequently died of AIDS. Sgt. 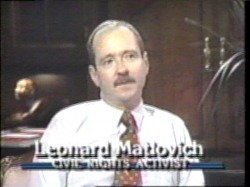 Leonard Matlovich was also a national figure having appeared on the cover of Time magazine. He too fought his gay discarge. On his tombstone in Arlington he has two pink triangles. One says, "Never Again"; the other, "Never Forget". Local activist Jim Woodward also fought his unfair discharge. My "Peter Parker" days (above). Just in from Viet Nam where I had lost 50 pounds (below). ^ A group of us GIs on a weekend in the Italian Alps. We planted marijuana seeds somewhere there in hopes of bringing homegrown pot to the European continent. (below) My "Dharma Bum" image after a month of railroading it across the Continent.